Our guide to double and secondary-glazing options. Better window insulation can make your home comfier all year round and there are a variety of ways to achieve this. These options vary in cost and effectiveness – and the most expensive may not be best for you. Touch a windowpane on a cold day and it’ll feel cold. It’s likely to be as cold as the outside air. When the warm (inside) air hits the windowpane, it cools and the heat escapes outside. There are 2 ways of dealing with this: using curtains to keep the warm inside air away from the windows or improving the heat loss from the windows through some form of double-glazing. The building code now lays down minimum requirements for new windows – that's almost certain to mean double-glazing. Make sure you’ve blocked draughts – and that you’ve insulated your ceilings, under the floor, and maybe the walls too. Once you’ve done this, the windows will be the cause of most heat-loss in winter and gain in summer. How much is lost (or gained) depends on where you live, the type of windows you have, how big they are, and the direction they face. Fitting double-glazed or secondary-glazed windows (see 'Glazing options') is likely to improve winter and summer comfort and also reduce noise. It may also add to the house’s resale value. But it’ll take many years to pay for itself through reduced heating (or cooling) bills. New double-glazed windows are effective. But research has shown that secondary-glazing of existing windows can be just as effective and cheaper – sometimes a lot cheaper. But before you look at glazing options, you should get your curtains working as well as possible. A good set of curtains can be as effective as double-glazing at reducing heat loss from windows. But if the curtain is open it's not doing anything – a layer of air must be trapped between the window and curtain. What’s more, curtains with a gap at the top and the bottom can form a "reverse chimney". That’s when the cooled air from near the window falls out the bottom of the curtains and is replaced at the top by warm air from inside. This could be worse than having no curtain. Although they’re no longer fashionable, pelmets help seal curtain tops. Sealing at the bottom can be improved by curtains that fall on to the window sills or touch the floor. “Thermal curtains” have a plasticised coating on the reverse of the cloth. The coating helps stop air passing through the cloth – but that’s not the major cause of heat loss with curtains. The fitting of the curtains matters much more than the cloth. For more information see our Curtains report. 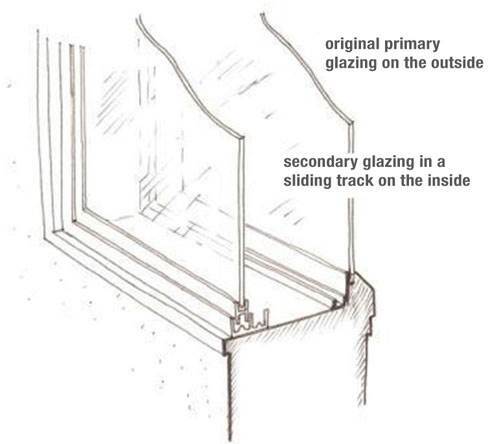 Secondary-glazing creates an air-gap by inserting a second pane of glass or other clear sheet behind an existing windowpane. Double-glazing has 2 panes of glass (or a pane of glass and another clear sheet) spaced apart by a gap containing air or argon gas, (which is a better insulator than air). This is then sealed to form an insulated glazing unit (IGU). the type of gas (air or argon) in the gap. The edge-seal of an IGU must not be allowed to remain wet. That means these units must be installed in a frame that allows free drainage of water. The unit can be fitted either directly into new window frames or retro-fitted into an existing window frame once the original glass is removed. This is used mostly in Northern-Europe and North America, where winter temperatures get much colder than here. 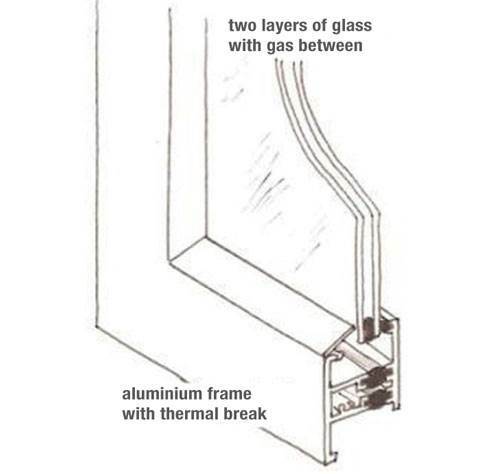 “Triple” glazing uses 3 sheets of glass to create 2 air-gaps. This gives even greater thermal performance – but it needs an extra-wide frame and creates a heavy window.